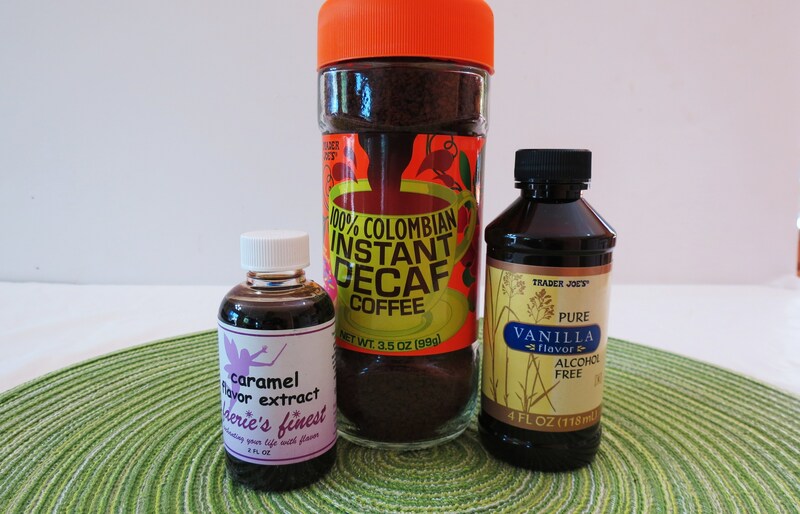 Today I have another one of my crazy coffee concoctions for you! This came from a reader who suggested I come up with a skinny version of the Starbucks Mocha Cookie Crumble. I did the best I could and I will say it is hella good!!! When I was looking for ingredients for this coffee, I saw Oreo Mint Cookies and thought that the wafer part, not the filling, would be perfect in my new Frappe. So in making this I scraped out the cream filling and added two wafer cookies to the coffee. Mmmm! This drink has just a small kick of mint to it! It’s perfect!! Almost tastes like a chocolate milkshake! I love it! If you’re not into mint, you could use a regular chocolate wafer cookie or a regular Oreo. I surprised my Husband and gave him a drink. He doesn’t like Frappuccino’s, He doesn’t believe that coffee should be cold. Let me tell you he was glad to take this coffee. He took it, asked for whip cream and out the door he went. I said wait! How do you like it, it’s really good honey! Wow, I got a honey out of him! That means he must have loved it!! For the topping I just added Redi Whip 5 calorie whip cream, and cookie crumbs. I used my mini food processor to process the cookie wafer into a crumb. That is optional, but it makes it pretty and it tastes good to!! I didn’t include that into my calorie count. Oh and speaking of calorie count, mine will not be exact. See, Oreo’s with out the stuffing is 25 calorie for each wafer. I do not know that the rest of the stats will be, but the calorie will be right on. Speaking of calories, ready for my comparisons? Ha ha! I love it!! Look at the calories, carbs and sugar! Crazy!! really, what do they put in there’s? Now you can make this at home guilt free!! 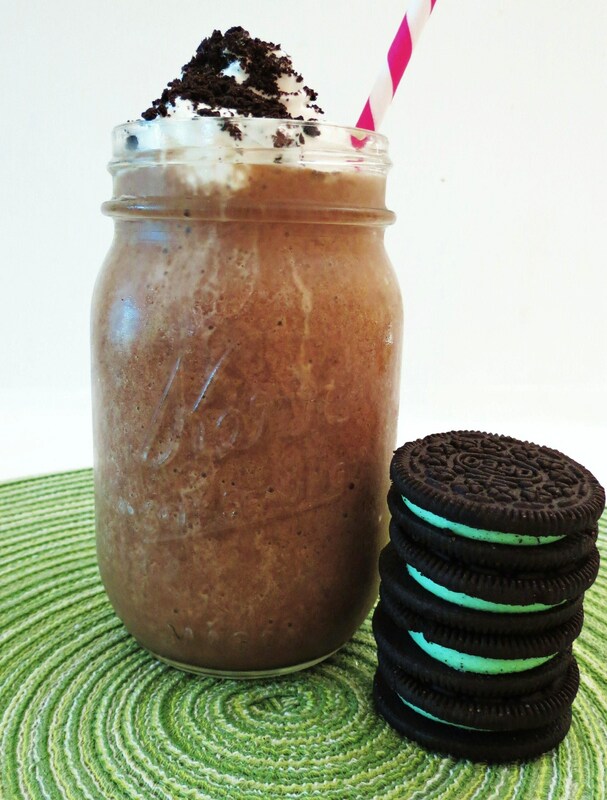 Chilled coffee blended drink made with cocoa and Mint Oreo Cookies. In a cup mix coffee and water and stir until combined. Place in a shallow container, cover and freeze for 4 hours or overnight. Let the frozen coffee thaw a little if your blender doesn't chop ice well. In a blender add coffee, milk, cocoa powder, vanilla, cookies and stevia. Blend until combined. Your probably wondering about the giveaway? I thought I would help you to make your Frappes at home! You will just need to add a few of your own ingredients. So I put together a little gift pack for you and one of the items is hard to find! But first you’ll be able to make these! Here’s a picture of some of the ingredients, but not all of them. What you have to do, is answer this question. If you could have one of these drinks I just posted, which one would you take? For additional chances to win, just be sure to leave separate comments and tell me you did so. I’ll pick a winner when I get back and announce it on Tuesday, July 17th. I just subscribed to your site! Gosh, they all look so good. I think I’d choose the Coconut Mocha Frappe. But what did you do with the oreo innards! I hope you ate them. Sigh I miss oreos sometimes. 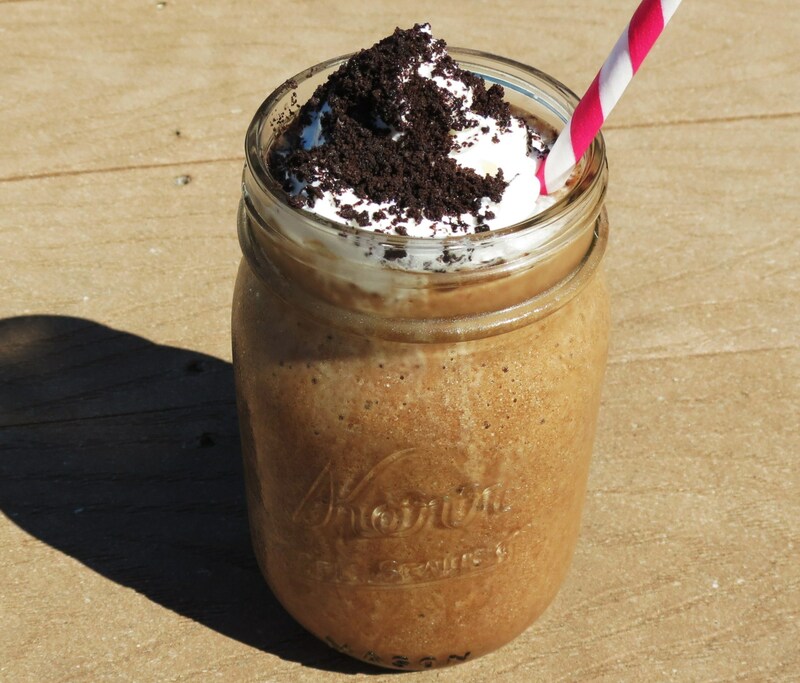 This is an AWESOME frappe! I am always so amazed at how much better for you yours are than the starbucks version! Delicious! I am an email subscriber! Tweeted your giveaway link too! Thanks so much! The Coconut Mocha Frappe sounds awesome! They all sound awesome, bu the skinny banilla mocha frappe sounds best! I subscribe to Peanut Butter and Peppers via email. I pinned your Buffalo Chicken Fingers – A crispy, spicy healthy version of traditional chicken fingers made with hot sauce and breaded with corn flakes and than baked. I would definitely have the skinny vanilla! Just love vanilla, plain and simple. Thnk you, these all look fantastic! Wow! This looks great! Fewer calories and I’m sure it’s not $5 a cup either 🙂 What does the xanthan gum do? Easily, it would be that Mocha Mint Cookie Frappe. It looks AWESOME! Skinny Mocha Mint Frappe is my delicious choice! Fantastic job lowering the calories on a usually fattening drink. skinny vanilla mocha would be my choice! 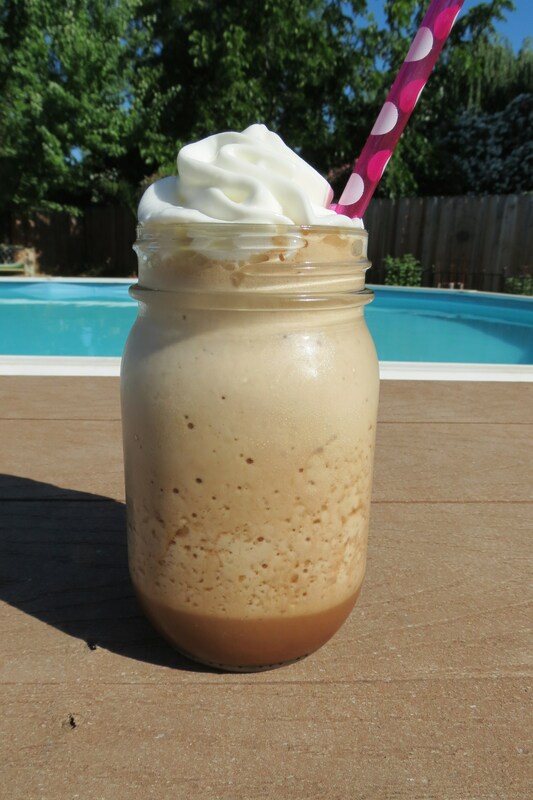 I would drink the skinny vanilla mocha frappe all day long! 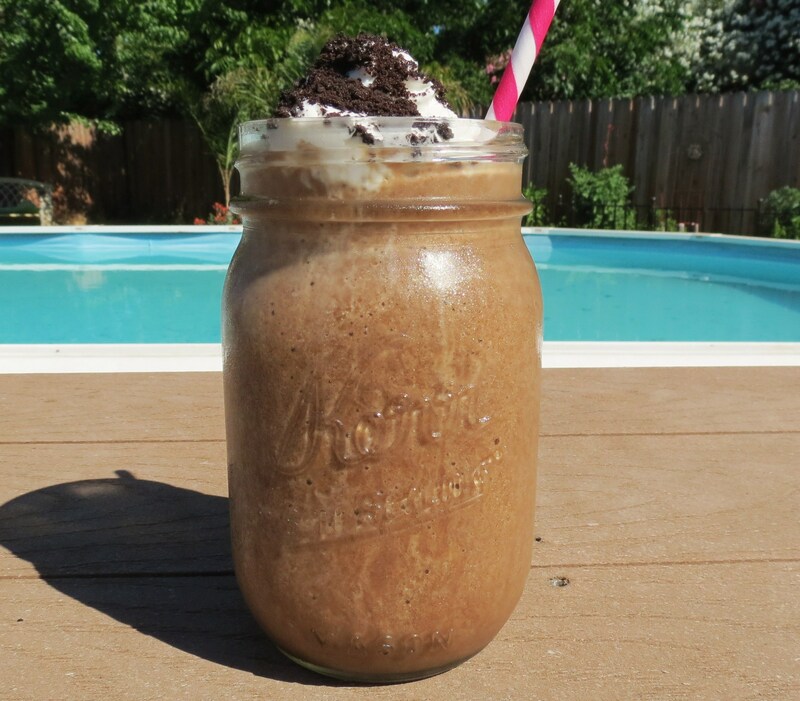 The Skinny Mocha Mint Cookie Frappe – that looks SO good! I subscribe to Peanut Butter and Peppers via email. I’m craving the Skinny Vanilla Mocha Frappe! I look forward to all your creative recipes! Skinny Caramel Latte! It looks SO good! I’m loving your blog and have passed it along to many, added your recipes to my ziplist, and shared your blog/recipes via Facebook. Great job! Thank you! What a fun giveaway. The recipe you posted today sounds really refreshing right now. WOW how fabulous are they. I’d want the skinny caramel frappe, since I LOVE caramel! I follow you on Facebook…no twitter, blogs, or pinterest account, but I do follow your pinterest posts! I would make the caramel frappe in heartbeat! The mint mocha for sure!! Oh i would love to try the skinny mocha mint cookie frappe. hands down! 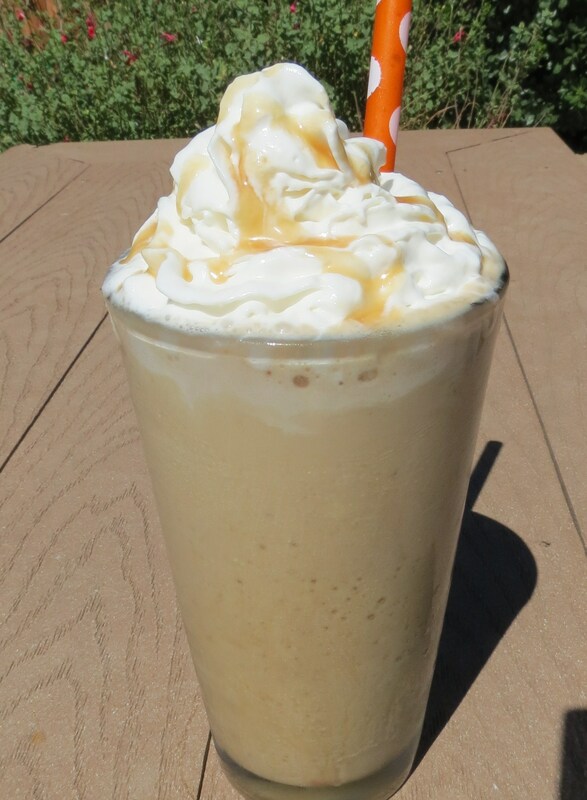 The Skinny Caramel Frappe. Caramel usually means loads of sugar and butter, but not in your recipe, and I am deeply impressed! You got my mouth watering with those photos! I follow you on Twitter as lifesdeepcolors! Coconut mocha frappe for sure! Anything peppermint reminds me of Christmas. And, I love Christmas…so the peppermint one! Thanks for the recipes!! 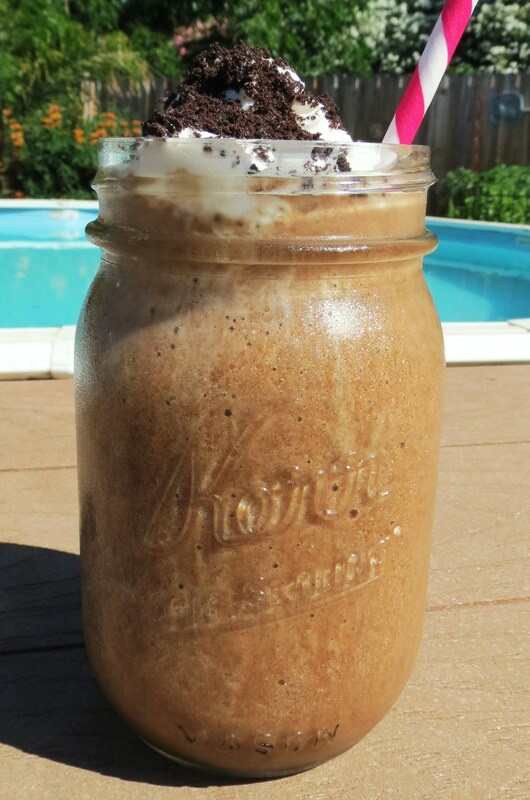 This is a nice article on Skinny Mocha Mint Cookie Frappe / Giveaway . I like it. 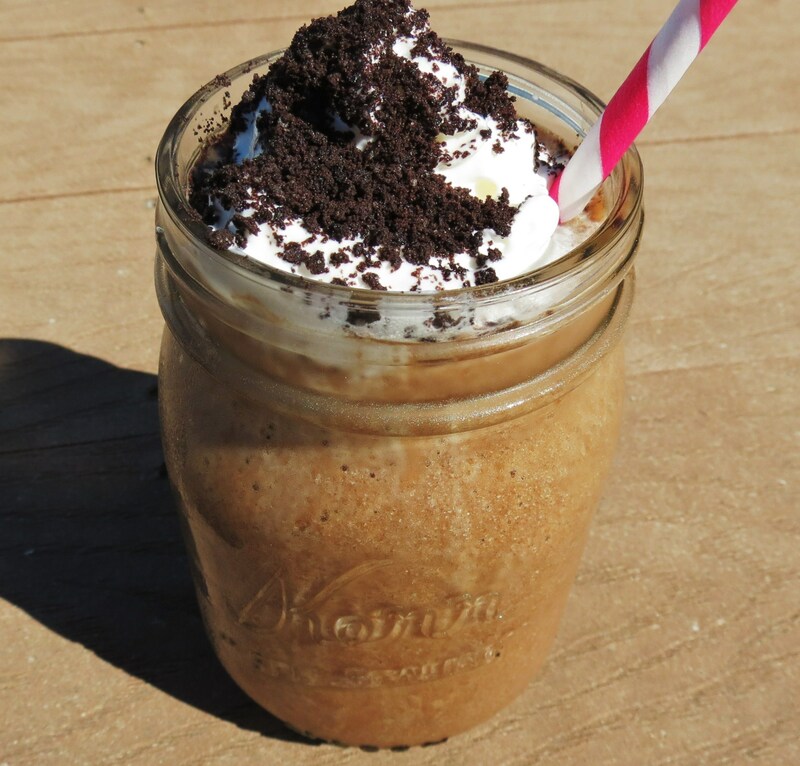 I pinned a bunch of your frappe recipes on Pinterest — here’s one. The mint one, for sure! I pinned the Peppermint Mocha! Coconut mocha, definitely. I’m on a coconut binge lately! Definitely the skinny mint one, it looks amazing!! I subscribe via email to Peanut Butter and Peppers! I would definitely pick the mint cookie one! I subscribe to your blog via GFC reader! 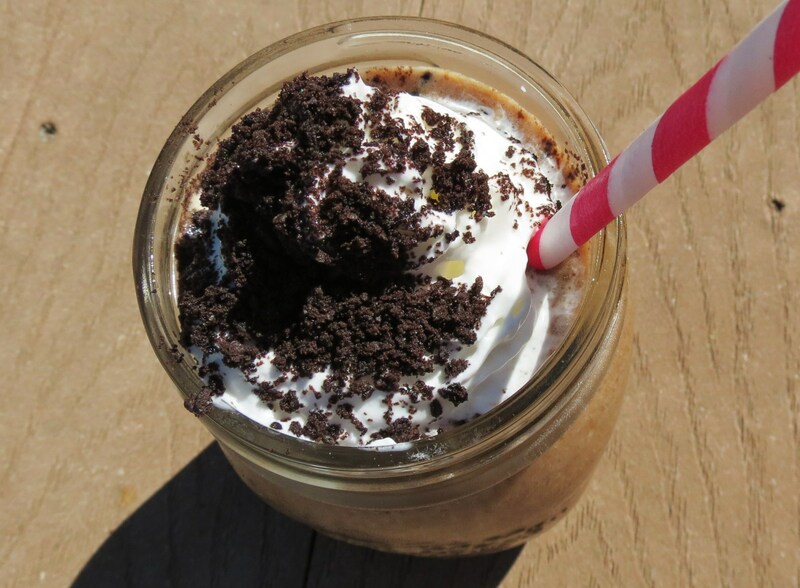 I’ve pinned your recipes before but just pinned one of the fraps! I live them, and make different varieties every day! Oh and to answer the main question, I need to try this newest frap now! I’ve. Axe the others and they’re great! I need to try the strawberry coconut milk one, too, still. Thanks for the awesome recipes! 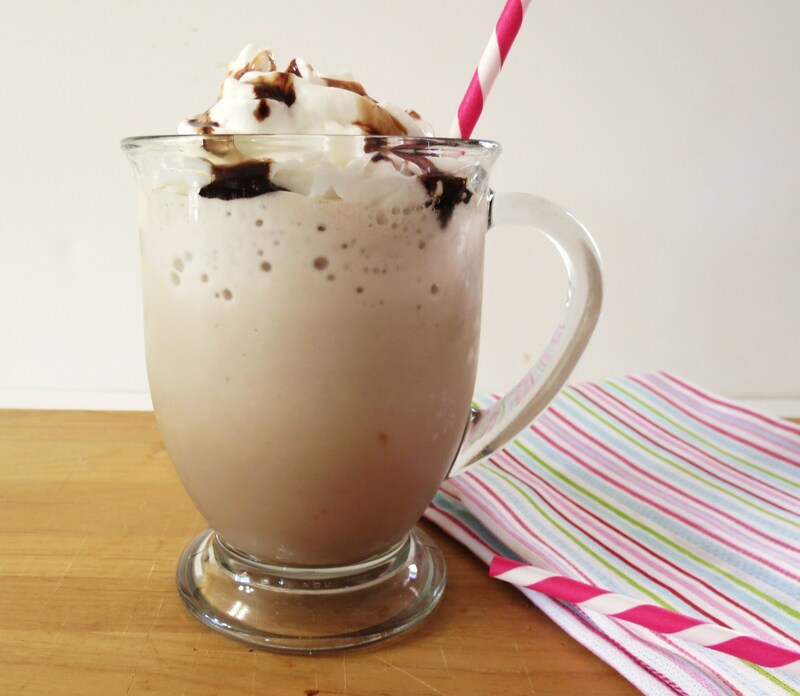 Awesome, I’m the one that asked you to make the Mocha Mint Cookie frappe…….gotta try it today! I know its’ going to be my favorite! Thanks for coming up with another great recipe! I’m following you on pinterest! 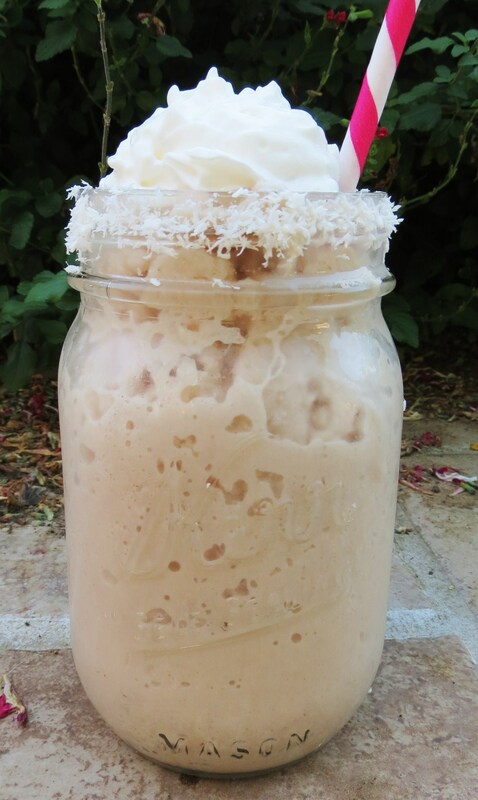 The coconut mocha frappe look delicious! Yes please! Anything mint please sign me up immediately.